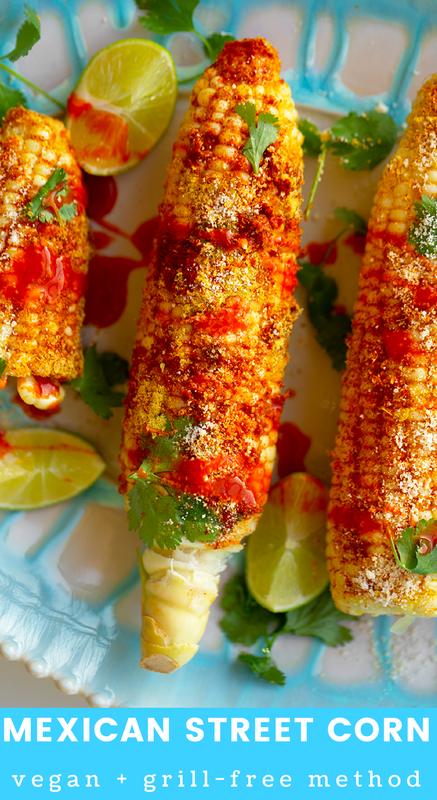 Spicy, cheesy, buttery Mexican Street Corn, aka Elote, is probably my favorite way to enjoy corn on the cob. You can make it outdoors, using a grill, for added blackened edges and extra smoky flavor. But for ease and convenience, you can totally make it indoors, no grill required, and it still tastes beyond amazing. And yes, my version is made using vegan ingredients. 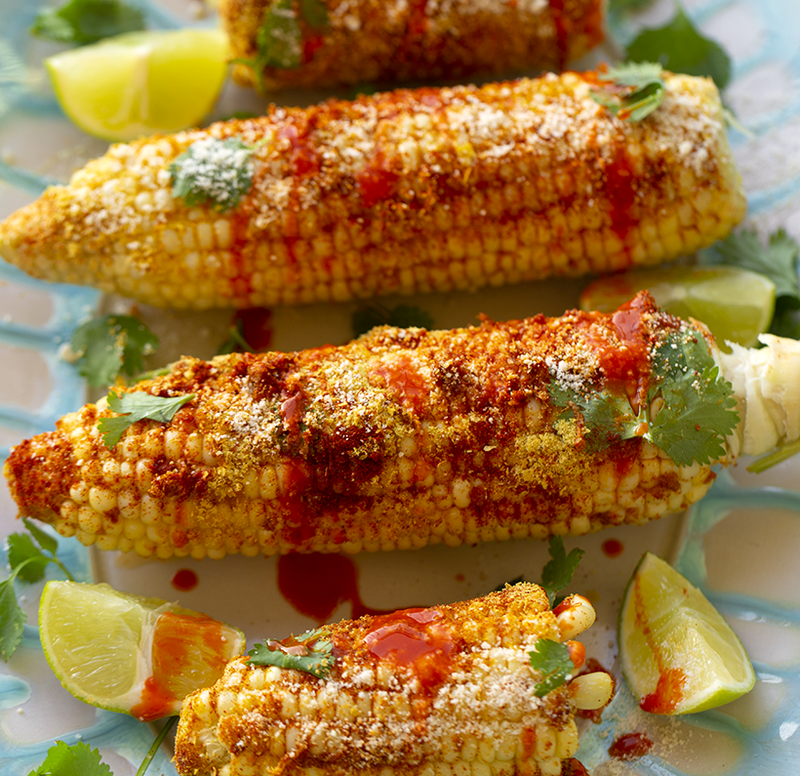 So if you are craving some super flavorful corn on the cob this summer, whip up this recipe. It is such a crowd-pleaser and looks SO pretty sitting on a platter. Party-perfect. Also today, after the recipe, I share some thoughts on Anthony Bourdain and mental health.. In my last post, for the giveaway, I asked you guys what some of your favorite summer foods are. Well the top faves seemed to be corn on the cob, berries and watermelon. Such simple things, but I totally agree with those answers. So you guys definitely inspired this post. 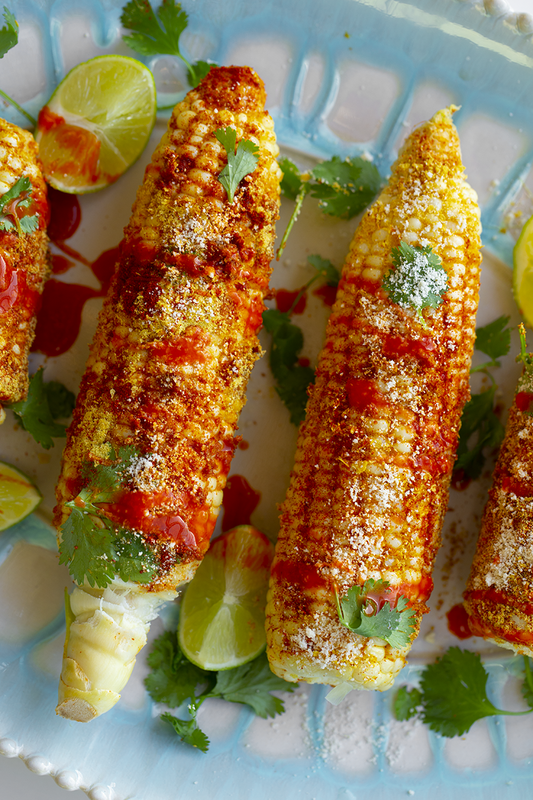 I saw some fresh summer corn at the store and whipped up this recipe. SO good! The layers of flavor in each bite are just delicious. 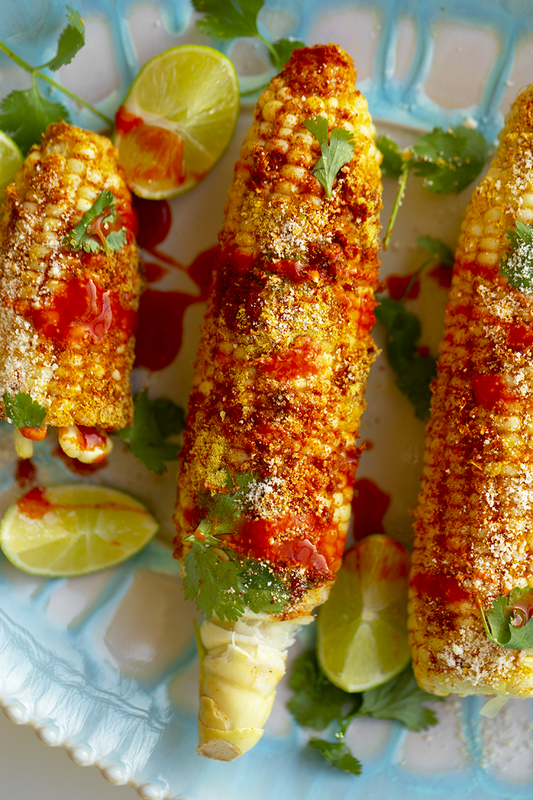 Elote, Mexican Street Corn, is a famous recipe. It usually involves an outdoor flame of some sort, and plenty of spice, lime, some sort of fat like butter or mayo and even some cotija cheese. Now these flavors are super easy to veganize and really do not skimp on any of the original flavor, which is awesome news for vegans like me. No-Grill Method. You can absolutely use an outdoor grill for this recipe, though if you do not have one, like me, you can easily make this by boiling the corn first, then slathering it in the spices and vegan butter and flavor. Full recipe below! 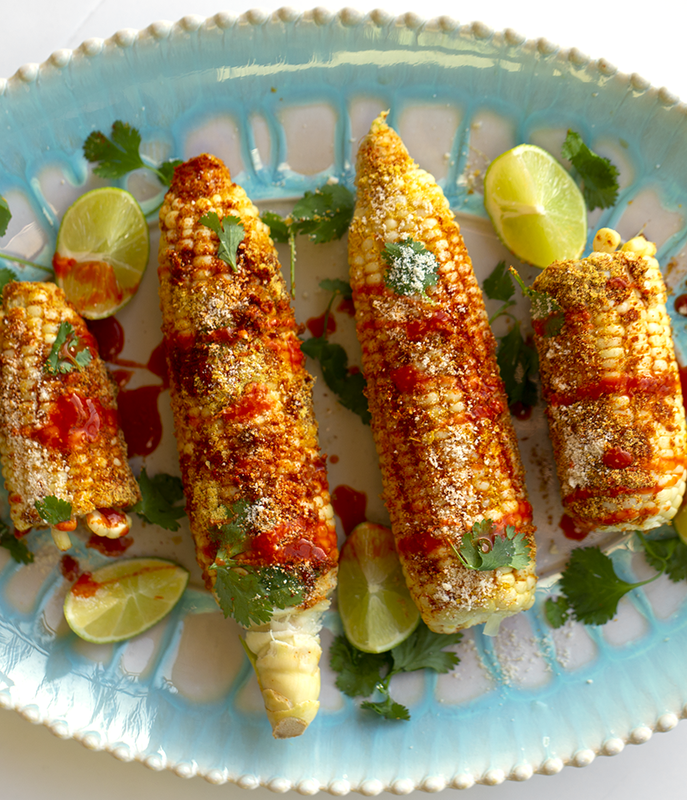 This easy and super flavorful way to prepare corn on the cob, uses spices, vegan butter and lime. Grill free method. Prep your corn by removing husks. You can either break corn into two pieces per ear, or use whole pieces of corn. Both ways work. smaller pieces are a bit easier to coat with spices. Bring a large pot of water to a boil. Add the corn. Cook 3-5 minutes, just until tender. Turn off water. In a wide and shallow bowl, add about a tablespoon of smoky paprika and two tablespoons of nutritional yeast. Stir the mixture around a bit. Place the butter on one side of the bowl. Using tongs, remove one piece of corn from the water. the corn will be very hot. Roll the corn around on the butter. Or you can even get a bit messy and use your fingers to slather the corn with some butter. Then roll the buttered corn around in the spices, pressing the spices into the surface of the corn. 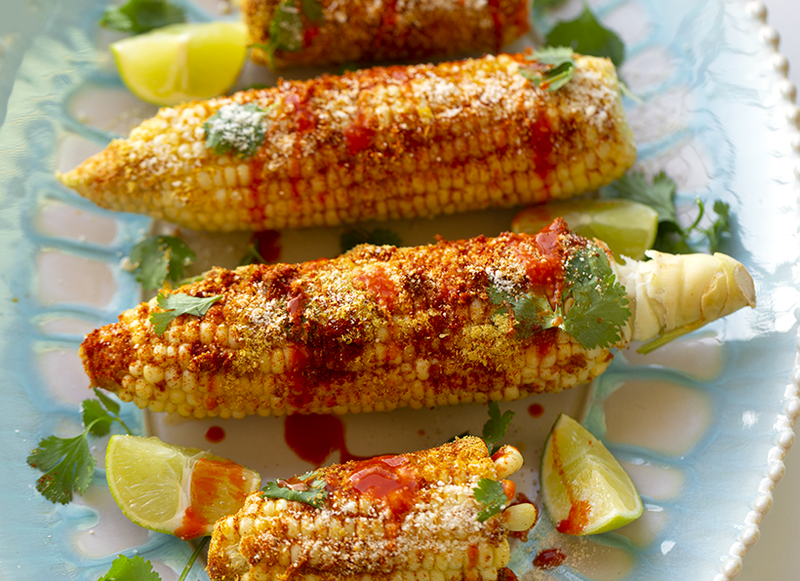 Take your jar or smoky paprika and douse the top of the corn with an added sprinkle of paprika. Place the corn on the serving platter and sprinkle a pinch of sea salt and optional vegan Parmesan over top. Repeat process until all the corn is slathered in spices and vegan butter. 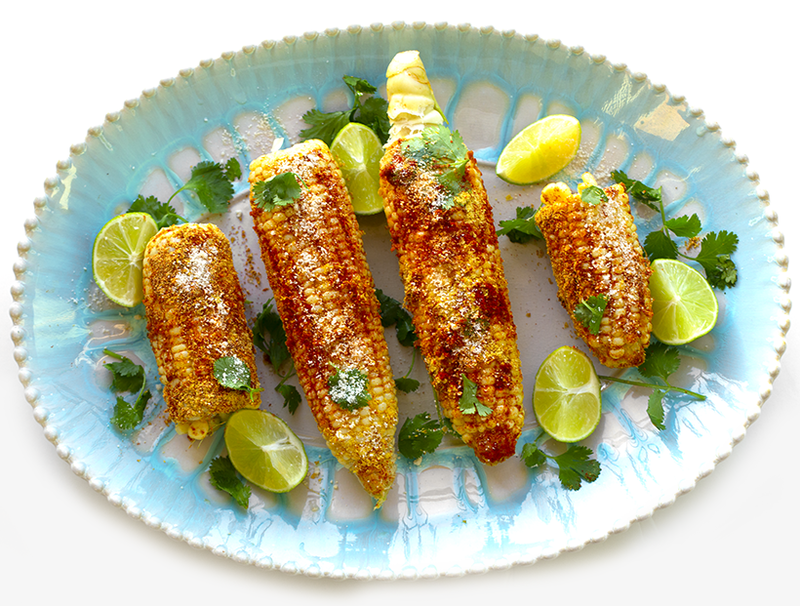 Place the lime wedges around the corn on the platter (for squeezing over top as you serve). Also sprinkle the cilantro over top. Finally, douse in hot sauce, if desired. Serve warm! Tip: For best flavor, allow the corn to sit for 10-15 minutes before serving to let the spices and butter marinate the corn a bit. Over the weekend, you probably heard about Anthony Bourdain. I was in bed, lazily scrolling through Twitter when the news popped on my screen. I darted out of bed and started reading the details with tears in my eyes. How do these things happen? What an incredible shame. What a huge loss for the world. And what a truly tragic end to someone's life. It is still quite unbelievable to me. I normally wouldn't comment on something like this on my blog, but I feel like I almost owe it to Tony to say thank you. If you have been reading my blog a loooooooong time, you may remember that back in 2008-2009-ish, I used to frequently fangirl over the brilliance of No Reservations on Travel Channel. I watched that show in pure awe. Cooking, eating, traveling, writing, friends, fun? Yes please, I wanted all of that. In a blogpost from 2009, I wrote.. "I may be one of the only vegans out there who adores Anthony Bourdain. Well, maybe not, but I did start a thread on the Tony Bourdain website called "Vegans Who Love Tony..."
Tony had such a mold-breaking voice in the food world and though we obviously disagreed about 'vegan food,' I soulfully admired how he wrote and interacted with the world in such an authentic, joy-seeking, misery-accepting, raw, real, curious and playful, usually hilarious on some level, way. I don't think anyone will ever replicate Tony. He created a new genre of entertainment. His ability to connect on screen - deeply - with anyone - from any background, was truly remarkable and left us all wanting to join him for the ride -- even a little old vegan like me. My favorite Tony moment was probably in his first season of No Reservations when he was filming in Iceland. He and his crew were caught in a blizzard of sorts - normal for Iceland in winter - and instead of camping out and waiting until more suitable filming conditions resurfaced, he created this whole hilarious and engaging story about embracing the storm. Making fun of his complete misery over the situation. And laughing that this was a 'professional' travel show. Basically, he didn't know how to be anything less than 100% real. 100% authentic. And 100% in control of the mood and energy on screen. Ah man, you will be missed Mr. Bourdain. Thank you. My first twitter bio ever was “a vegan who loves Anthony Bourdain.” He was a huge inspiration for starting my blog bc he took food and travel and people and smashed it all together in heartfelt brilliance. Crushed. #RIP Tony. If you want to hear some of Tony's early (brilliant) work, read Kitchen Confidential - the audio book version, read by Tony. Also worth mentioning.. Mental Health. This blog isn't called Healthy, Happy, Life for nothing. I always want to speak on wellness issues on all fronts, to the best of my ability. I feel like so many people have said this lately, but I will say it again - never be ashamed to talk to someone if you are going through a hard time. Today's information-clogged world is kinda crazy. I especially worry about teens and college students these days. You guys see and hear SO much. Please start practicing self-care now. Find ways to be HAPPY, JOYFUL, and CONNECTED. Truly connected. You don't need fifty-billion friends. Just a handful who truly know and unconditionally love you. Support each other. Check in on each other. And check in on yourself. Self-care is something we all probably need more of. It is a constant journey to feel at our best physically and emotionally. Please also know that you are not alone, ever, and things will get better. You have to believe that, even when you don't. I'll end with this quote..